After IS: Will Mosul reconstruction be next arena of influence in Middle East? Is Iranian Influence in Iraq Waning? To remedy the economic problems created by the war, Iraq sought, after the cease-fire, to maximize its oil exports, but, unfortunately for them, oil prices at that time were low. Baghdad believed that over-production of oil – by its neighbour Kuwait, among others – was responsible for this situation. 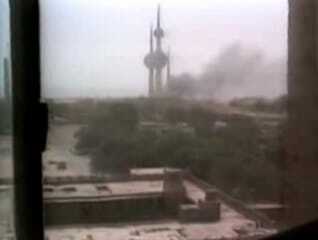 After verbal threats to the emir had no effect Saddam Hussein’s regime, on 2 August 1990, ordered the invasion of Kuwait. 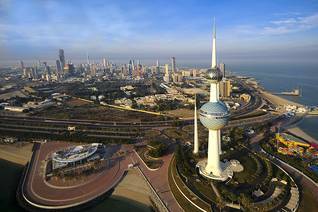 The occupation was followed by Kuwait’s annexation as the ‘Nineteenth Province of Iraq’, in accordance with old agreements from the Ottoman and Mandate eras, which Iraq now resurrected. With the annexation of Kuwait, the regime of Saddam Hussein thought it had killed two birds with one stone: the moribund Iraqi economy would be stimulated by the wealth of the emirate, and the annexation once again gave Iraq access to the sea. Like the Iranian province of Khuzestan, Kuwait borders both the Iraqi province of Basra and the Persian Gulf. 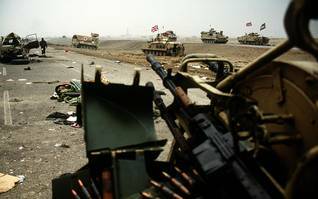 Although Kuwait’s Armed Forces were no match for the large Iraqi forces – which had had eight years of combat experience – the invasion of Kuwait was ultimately a military catastrophe for Iraq, bringing a war with the United States and a large coalition of other countries, including erstwhile Western and Arab allies. Since the end of the war with Iran, these countries had been deeply concerned about the efforts that their former ally had undertaken to expand its arsenal of unconventional weapons, supplemented with booster rockets, long range rockets and a ‘super cannon’. 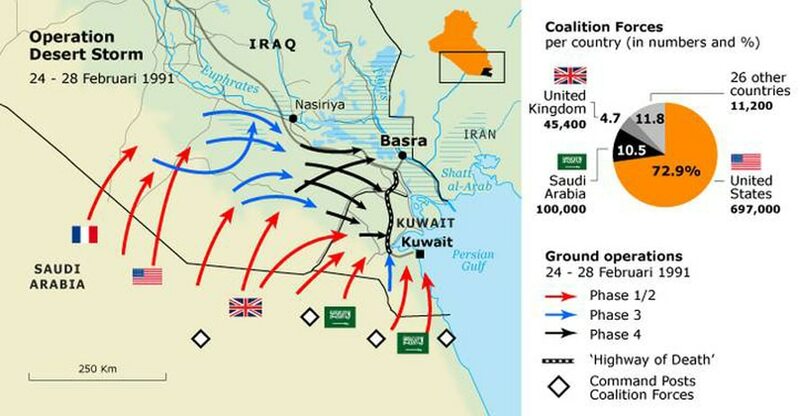 Iraq’s attack on Kuwait gave those former allies an opportunity to reduce Iraq’s military capabilities, and they believed that Iraq had to be stopped from becoming the leading power in the Persian Gulf by its annexation of Kuwait’s oil reserves. Western propaganda also emphasized the necessity of restoring international law, which had been violated by the Iraqi invasion of Kuwait. During the Kuwait crisis the United Nations took a remarkably unified stand. Many saw in this a hopeful sign of new relationships – a New World Order – coming into being after the end of the Cold War. The reality was something less. During the crisis the United States largely succeeded in having the United Nations carry out policies formulated by the US Department of Defence. After United Nations resolutions requesting Iraq to withdraw immediately and unconditionally from Kuwait, the first of a dozen UN Security Council resolutions was passed on 6 August 1990 (Resolution 661) at the insistence of Washington, four days after the invasion, imposing a trade embargo on Iraq. A land, sea, and air blockade was imposed to enforce the embargo, and Saudi Arabia and Turkey shut down the Iraqi oil pipelines that had been built during the Iraq-Iran war. Iraq was left immediately with no source of income. In the following months the US was able to tighten the screws further on Iraq, and a multi-national military force was being assembled under US leadership, which included, in addition to several Western European countries, Saudi Arabia, Egypt, Syria, Morocco and Pakistan, and others. Kuwait and Saudi Arabia provided the necessary financing. In an attempt to guarantee peace on its eastern border, Iraq made its neighbour Iran the somewhat unconvincing offer of sharing the Shatt al-Arab again. Iraq also sent its fighter jets to Iran for safekeeping, ahead of the looming war with the US-led coalition. Iraq never got them back.